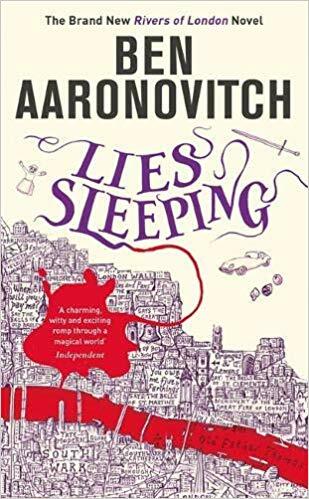 Keeping up his fine reputation for outstanding novels, Ben Aaronovitch continues his Rivers of London series with Lies Sleeping. If that name seems somewhat familiar to you, then you maybe you’ve seen his work on several Doctor Who serials, or even read his Blake’s 7 spin off novels. If you aren’t familiar with Ben’s work then now is a good time to sort that out as Lies Sleeping may just be his best work yet. 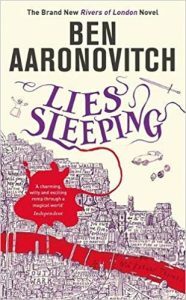 Once again young police officer and apprentice wizard Peter Grant, who has previously had to work in alternate timelines, track down super rich criminals and fend off all manner of ghouls and ghosts, finds himself with another strange case to solve; a case that could bring an end to London as he knows it. The now unmasked Faceless Man is at large and after committing a multitude of murders, has something larger up his sleeve, which even the young wizard may struggle to contend with. Grant has to look at every resource at his disposable, even the more deadly ones if he is to bring the Faceless man to justice.